Essentially it boils down to Desmond being stuck seemingly unconscious inside the bowels of the animus, tangled up in his ancestor’s memories. Desmond needs to play out Ezio’s final days to separate their memories for the animus and do a bit of “finding himself” inside this virtual world the animus has left him stranded in. In turn, Ezio needs to find the keys to Altair’s library in the old Assassin’s fortress to unlock the knowledge therein. In finding these keys he relives some of Altair’s crucial memories. Did you get that? 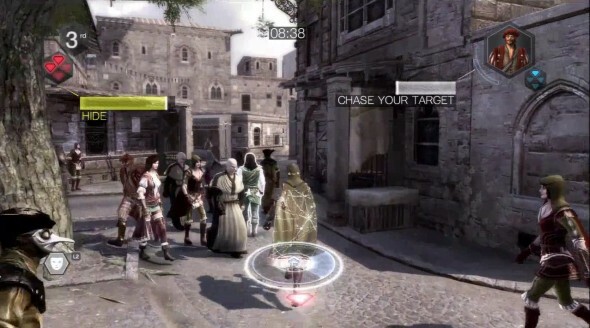 The meat of the game involves the player as Ezio searching for the keys in Constantinople and vying against the remnants of the Byzantine Empire, this iteration’s arm of the ever-present Templars. The city itself shares the same level of detail and historical accuracy as previous games, the architecture looks incredible and there are more ottoman rugs, shisha dens and minarets than you can shake a hook-blade at. It’s easy to take such an achievement for granted, but it is the consistently solid element of the series that constitutes its lifeblood from a conceptual and gameplay standpoint. There’s no shortage of additions and improvements to general gameplay. You’ve got a new “hook-blade” that facilitates faster climbing and speedier rooftop travel making use of conveniently placed rope lines (Old Ezio will take all the help he can get now he’s pushing 60), a surprisingly detailed bomb crafting system, that allows you to craft bombs using materials you find in the world to make all types of bombs, specifying how they’re triggered, their power and their given effect. Thing is, although very viable, they’re not necessary – you can go the entire game not using them once except for the brief tutorial, should you prefer the pure and simple shanking of your various blades. There’s nothing wrong with more options but no one’s going to buy Revelations on account of the DIY demolitions. Along with all the shop renovating (and just about everything else from Brotherhood) returns den takeovers, which allow you to command more assassins. However, this time, the Templars have figured out the art of retaliation and will often try to take dens back. Your defence comes in the unlikely form of a tower defence game. 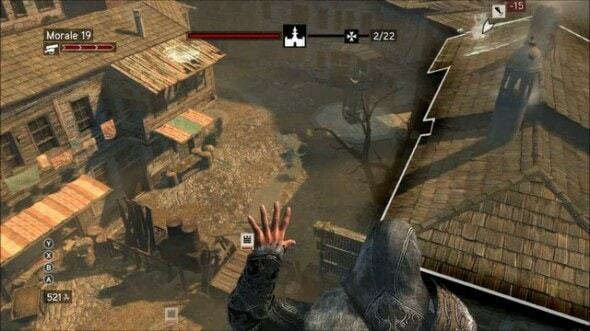 You sit atop a roof overlooking a street (that oddly doesn’t actually exist in the real city) and spawn units, ranging from bombers to crossbowmen, on the roofs and barricades on the ground, using rechargeable cannons and your own hidden gun as ancillary weapons. It’s a decent enough constructed mini-game but feels a little out of place, even if it is an attempt to vary gameplay. It may be my overbearing cynicism, but I couldn’t shake the feeling that it was a new feature for the sake of warranting a new game this year. 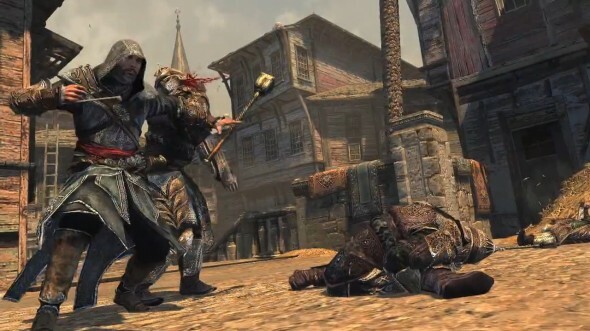 Aside from that stuff, improvements are all over the shop from challenges which help level your assassins, master assassins who look after your dens, new NPC animations, better uses for eagle vision and plenty more combat finishing moves that again deliver a great sense of satisfaction, if the counter and dodge combat style of the series agrees with you. By and large everything from Brotherhood is back and better, feature-wise. In fact, the only thing I can think that is missing is horses, which is a shame, as aside from Red Dead: Redemption, Assassin’s Creed was one of the few games that realised our equine friends well. It also feels like we’re getting more menus. No bad thing for the strategy fans out there, but sometimes it all feels a bit in-cohesive, even if the constituent parts are crafted competently. Despite my jabs at the structure of the narrative at this stage in the series, the individual stories of our three protagonists hold together well and in the case of Ezio, provide plenty of fun set pieces that help with pacing. In addition to this, they’ve managed to offer some interesting settings and inventive missions, that involve everything from racing, platforming, combat and puzzle solving. All that fun stuff definitely hasn’t outstayed its welcome – it can sleep on the sofa for now. If there’s one area where I feel Revelations fills a spot Brotherhood just fell short of, it’s characterisation. Ezio meets some brand new friends who fairly quickly found a soft spot in my heart and the dabs of cheesy humour didn’t go amiss. Of course, seeing Ezio’s final plight is fulfilling as well, and his exit is an admirable and humble one. Equally, the surprise triumph for me was that of Altair. The original game didn’t really make me feel any love or empathy of the stoic assassin, it didn’t seem all that personal, but the five sections in Revelations cast him in a whole new light in which we see his struggles and hard-won successes, making him a fully developed character. This, in turn, fleshes out and strengthens the franchise’s roots, leaving the prospect of future stories all the more promising. I should mention the Desmond sections which are very unexpected indeed. There are five short sections that see Desmond in first person mode, traversing the inner core of the animus reminiscing about his childhood right up to his abduction by Abstergo. While he does this you spawn shapes to get around and avoid certain materials that dissolve you or your spawnable shapes. It’s all rather abstract and weird. Again, not necessarily bad – at least it’s original – but slightly incongruous. Along with the den tower defence, this seems like a divisive feature, but in this case, those who don’t wish to participate can ignore it altogether. In terms of usability, more than ever I’ve noticed this game suffers from a frustrating amount of loading, spread throughout different processes. Whether it’s standing in the empty animus world waiting to load in or waiting 3 seconds for the start menu to come up, it may be a symptom of the extra menu systems and/or the slightly dated engine. Speaking of which, the graphics are fine, but are starting to lag behind some more recent titles – it doesn’t quite pack the punch that the original game did at the time, in relation to graphical fidelity. 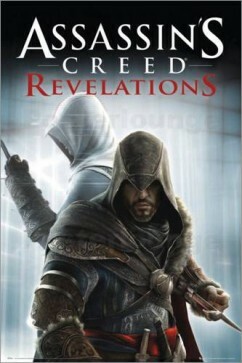 Revelations also offer a vastly improved and honed version of the intriguing multiplayer that Brotherhood debuted. Gone are the excruciating matchmaking attempts and the confusing UI. It probably won’t offer the longevity that your staple multiplayer games do, but it’s a great element of the game that allows for an original competitive dynamic, fleshed out with a decent amount of upgrades and special abilities. Clearly, Ubisoft has nailed the iterative improvement cycle – there’s no question that this game offers a wealth of content (enough to stand up to any of the other triple-A singleplayer games out there, and then some) and a host of worthwhile improvements. But at the risk of sounding cliche, there’s a certain spark missing that I’m really hoping the 2012 sequel can inject back into the series with a new setting and protagonist. As for the revelations part, up until just before the very end I was going to label it as more of an interesting exposition of our protagonists, but turns out that the end does provide some big answers…then a generous helping of what the ending of Brotherhood gave us! If you’re a fan of the series, this warrants a purchase without a shadow of a doubt – it’s a fantastic game, but you can’t help but look at it in the context of its prequels and what they already provide. If you’re a newcomer, the story may seem a little overwhelming at first and you’d be better off fetching a cheap copy of Assassin’s Creed 2 or Brotherhood and working from there to see if their series floats your boat from the outset. In spite of the slightly disjointed feature-set and the scepticism that yearly sequels precipitate, Assassin’s Creed: Revelations manages to hold its own thanks to a good story, great characters and an extremely solid basis of gameplay, on which it improves. If you’ve enjoyed previous assassin’s outings, you can’t put a foot wrong here. Ubisoft has managed to make Ezio’s last adventure worthwhile – but there can be no resting on their laurels from here out. I’d give this game 8.5 out of 10. Xbox Kinect Sensor Review – Should I Buy The Xbox 360 Motion Controller? Nintendo 3DS Review – The Good, The Bad And The 3DS!